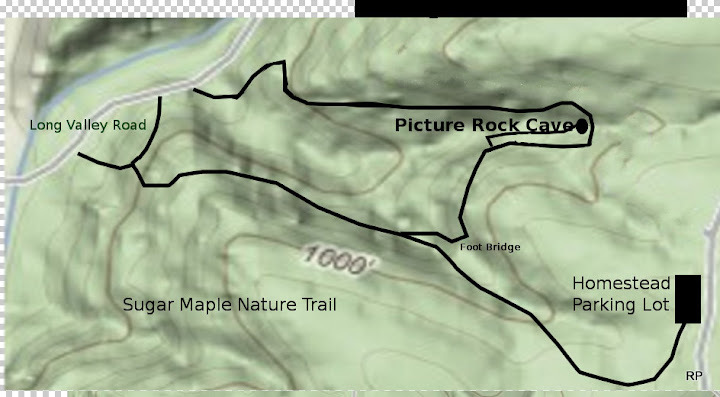 ...near the top of the Sugar Maple Nature Trail map (shown above) is going to be the newest trail in Wyalusing State Park. During week two, the trail crew widened the trail as well as terraced the bluff side of the trail cut. Last week, (June 1, 2009) the Department of Natural Resources trail crew had just opened this section of new Sugar Maple Nature Trail. The digging was fresh. The red and blue trail flags, used to mark the new trail cut, were waving in the breeze. The photo, above, shows a 'full-bench' cut into the hillside. The finished trail bed will slope slightly to the down hill side. This allows water to fall off the trail in a sheeting action. Backsloping is mostly done by hand tools. The backslope is blended into the natural slop of the hill. It allows water to 'sheet' off and move slowly down the hill side. The minimal impact motorized trail machine is used to push the dirt aside and leveling the trail. This hiker saw no 'trail closed' signs or barricade. However, the trail goes up hill and around the bend....then stops. It is not a hike through, yet. With recent rains, the trail will be very muddy and slippery. After a steady uphill walk, the hiker reaches a switchback cut into the hill. Shown above, is the switchback, the lower trail as well as Long Valley Road. Ditch Witch awaits next week's work. Beyond the Ditch Witch is the end of the trail, so far. Week two's progress is characterized by widening of the week one's trail cut. The trail crew has worked to backslope the trail along the bluff. The trail's end has not progressed beyond the end of the brown line. Look closely. That's us on the upper left! 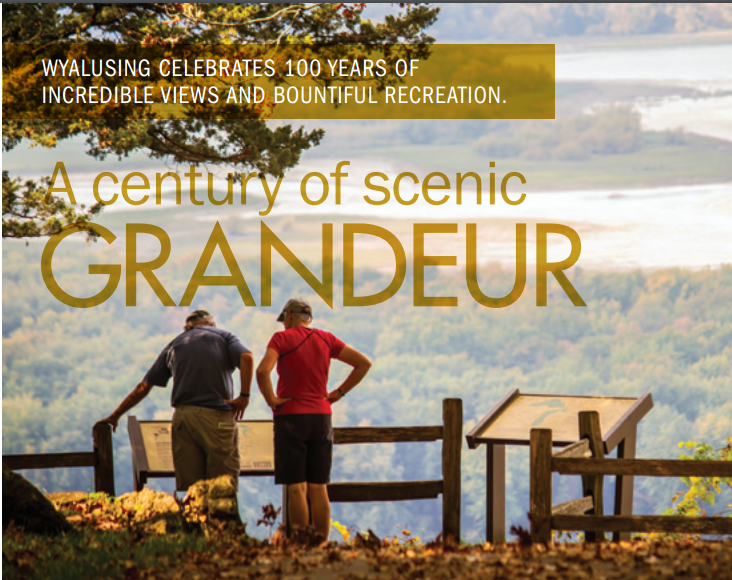 The photos is from the Friends of Wisconsin State Parks (link) There are over 70 local Friends groups in Wisconsin. The Friends of Wyalusing State Park was the first to establish an endowment for a state park. More information can be found here. Wyalusing State Park also received a nice news write up by a Chicago News Writer. The article can be found here. Ted Nelson is a writer for the Chicago Adventure Examiner. to submit your photos and other information, click here.